Right guys been lurking on here for ages but this i my first question so please be gentle. Recently bought some y2k junior t’s (20mm axle) off eBay which are in great nic, fitted them but when I put the wheel in (big un) the wheel spacing is wrong it measures 110mm which corresponds with the service guide I have found but can’t find any info on the spacing or what hub might fit. Any body got any ideas?? The fork is too wide for the hub or vice versa? I’d never heard of a non 100mm oln front hub/fork in mtbing until boost came along. Piccies might help show the problem. You got the right spacers / cones on the hub? 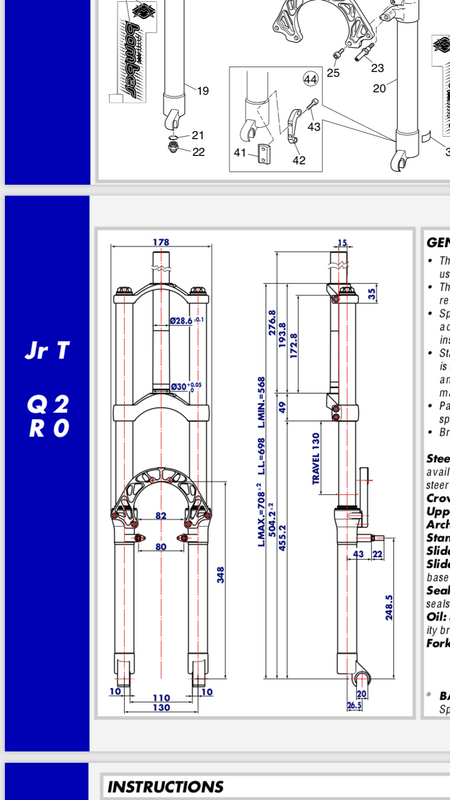 Neither had I but according to this manual for the 2000 junior t.
Qr20 different to standard 20mm bolt thru? I’ve tried to search rick but am comming up short on another post about this? "I’ve bought a y2k marzocchi bomber junior t fork not realising that qr20 is not the same 20 bolt through"
Well that’s embarrassing. I really must stop and think before posting stuff. So hope have confirmed all 20mm axles are 110mm. I had sort of figured this as I managed to measure my other forks/hubs today. The reason my big un doesn’t fit is I have clearly mixed up the spacers because it measures 105mm. Thanks for the input folks. Bottom line is I’m an impatient muppet. But I did learn that 20mm axles are all 110mm.